How do I login to use library resources (databases, articles, etc.) from off-campus? Why do I need to? How do I find sources about my research topic? How do I get help with my research? How do I cite my sources in APA, MLA, Chicago, etc? How do I read a call number? How many items can I check out and how long can I keep them? How do I download an e-book? I'm having problems accessing a journal article - the system says it's not available or asks me to pay for access. How can I get help with this? How do I apply for a job in the library? Where is Room 130? Room 125? International Affairs? CETL? How do I put materials on Reserve? Where are Reserve materials located? How can I donate books to the library? 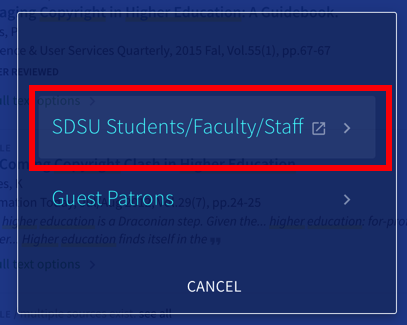 How do I set up Google Scholar to work with SDSU resources? Signing in to the Quick Search or the Library Account link on the library's homepage will allow you to renew your library books, save your searches and results for later use, and request items Briggs Library doesn't own through Interlibrary Loan. These screens are from the Library Account link on the library's homepage. Click on Library Account then on Sign In. This screen is from an article record after searching in the Quick Search. 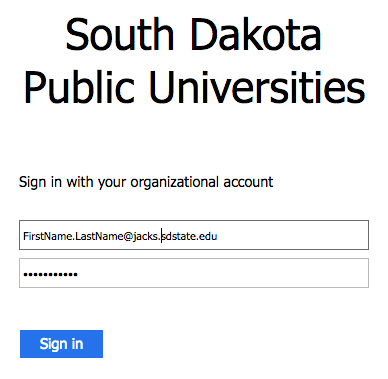 Click on Sign In. Use your full e-mail for your username and your e-mail password for your password. << Previous: How do I reserve a study room?